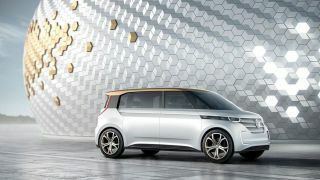 VW is showing its vision for the future of driving at CES 2016, and it's one that revolves around gestures and long-range EVs. The first innovation is a compact car with a gesture-control infotainment system, what Volkswagen is calling the first for the class. The e-Golf Touch features a 9.2 inch, 1280 x 640 display with the latest version of VW's Modular Infotainment Toolkit (MIB). Users can configure the homescreen to their preferences and use tiles to select 10 functions, such as , media, music and phone. Closest to the driver are four buttons - Menu, Home, Car, App - and a knob you can push and turn. The actual screen of the display is 8.2 x 4.1 inches, though users can also select two tiles along the right side of the display. A tile of 1.7 x 2.4 inches will have its own function. Improved voice controls are also part of the e-Golf Touch experience. Now when a voice command is uttered, it's also displayed on the screen, presumably so there's better verification of the command all around. This feature will come to European cars in the early summer. VW is also giving backseat passengers the ability to charge their phones using the armrests. It should make whomever is stuck back there happy that at least they can juice up their devices. And to make it easier to communicate with passengers in the back, VW has something called electronic voice amplification, which utilizes improved acoustics, hands-free microphone and rear speakers to make it easier for those in the front and back to talk to each other. Features shown in the e-Golf Touch will be available in future cars, VW said, which we expect will be in 1-3 years. Faraday Future isn't the only one coming to CES with a concept car. VW has its own set of wheels to show off, the Budd-e van, which is a lot more futuristic than your standard Toyota Sienna. This zero-emission car is built based off the company's Modular Electric Toolkit (MEB), and with its 101 kWh battery offers a reported 373 miles of pure electric travel range. It's battery can charge to 80% capacity in 15 minutes, VW claimed, which is insane. The Budd-e feautres a futuristic interior, with displays for the infotainment and controls ribboning the front of the car. Budd-e isn't just a car for driving. From the vehicle, passengers can tap into their homes and workplaces to control the AC, turn lights on or off, or check in on their kids. The IoT comes to cars with the Budd-e. Gesture controls are a key feature, letting users interact with the car from the inside and outside, using displays and projections to interact with the vehicle. It's equipped with cameras so it can tell if a passenger in the back wants the sliding door to open. Gestures will even be recognized even if the systems aren't told to turn on. While just a concept, VW envisions vehicles like this being on the road in 2019.